What does portfolio optimisation mean? Think about your portfolio. It does not perform as you would like and you do not know how to implement changes to improve the returns. Should you read all kind of reports? Of all possible assets? That’s nonsense. There should be a method to optimise and change efficiently your portfolio. There is actually and method: portfolio optimisation. When we talk about it, it means the process of choosing the weights of different assets for your portfolio in order to obtain the best possible returns compared with similar portfolio compositions or risk profiles. The main measures taken into account are the expected returns and the expected volatility. 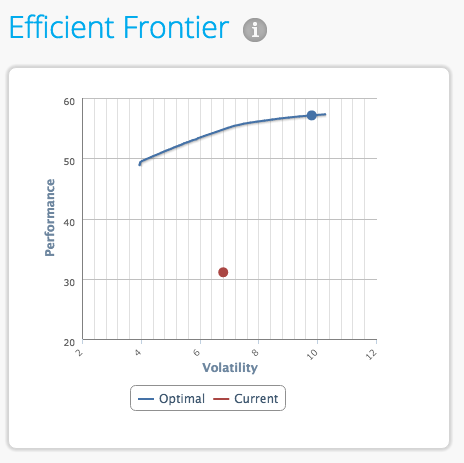 Optimisation systems include limits of accepted volatility and weight per assets. The system is linked to the Markowitz Efficient Frontier model that pretends to guide your investments maximizing your performances and reducing the risk. The main point that supports this model is choosing low-correlated or uncorrelated assets. Smart diversification is the idea behind it. An efficient portfolio means a well-diversified one. The smart combination of the four indicators provides the success of the investment. They can change depending on your risk profile, but accepting a higher risk does not mean being suicidal. There is also another very important point: the costs. If you optimise your portfolio and follow the results of the optimiser tool, you have to rebalance your portfolio. A rebalance means trades to buy and sell in order to compose the portfolio following the optimisation indications and… it has costs. However, we have to remind that investments are for long-term and rebalances should be executed every certain time. In these cases, costs can be balanced out with the improvement of the returns. If you are a day trader, then forget this, because you are other kind of investor. This entry was posted in T-Advisorpedia and tagged Diversification, expected return, Optimisation, Portfolio, rebalance, Risk profile, volatility on January 26, 2017 by Oscar Garcia.